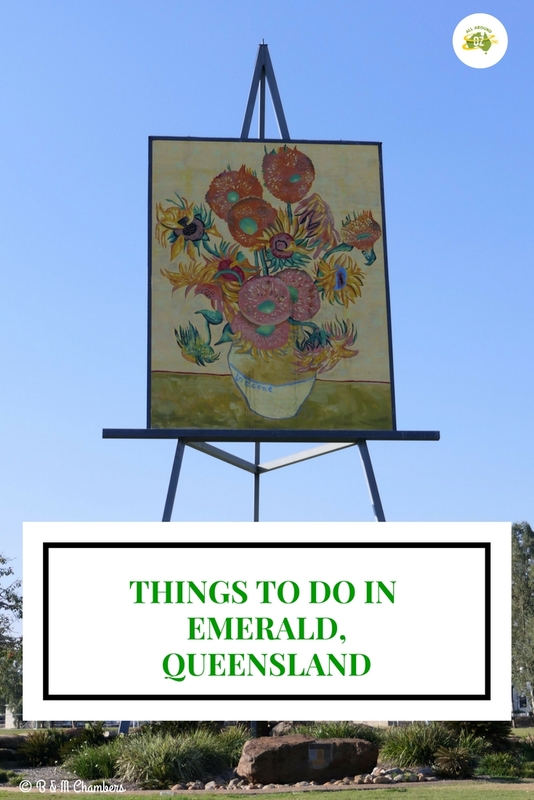 Emerald is a large town located in the Central Highlands area of Queensland. With a population of over 15,000 people it is well known for it’s agricultural and mining pursuits. And as we discovered there are plenty of things to do in Emerald. As we often do when visiting a new area we called into the local Visitor Information Centre first off. Located in Morton Park, it is an easy spot to find because of the giant sized replica of Vincent Van Gogh’s famous painting ‘Sunflowers’ which stands in the middle of the park. At 25 metres high, it really is hard to miss. Also located in Morton Park is the Pioneer Cottage Museum which showcases the history of the Emerald area. Another lovely feature of this park is the Centenary of Federation Mosaic Pathway which depicts 100 years of history in 100 metres. Make sure you also check out the incredible sculpture at the front of the Visitor’s Centre. 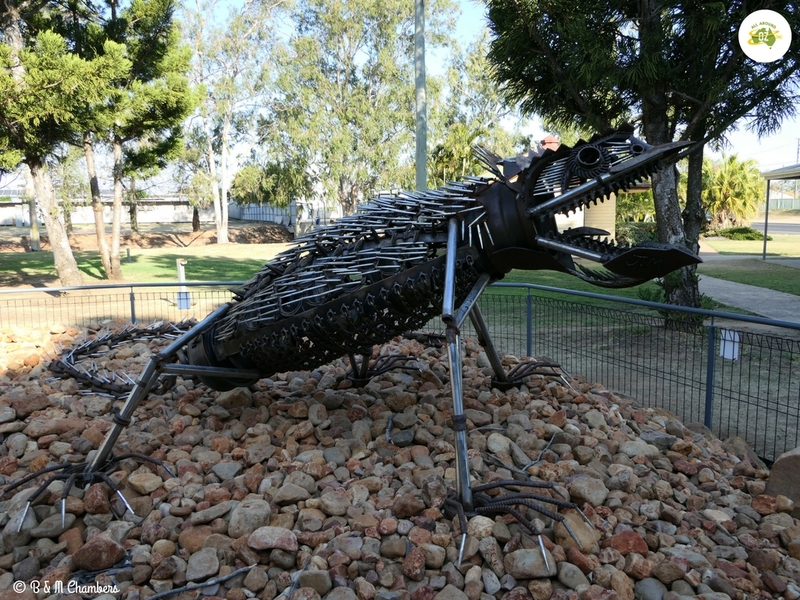 Made by local artist Jase Moore and titled ‘Emerald Dragon’ it is made entirely from scrap metal. It was purchased and donated to the Central Highlands Regional Council anonymously. The Emerald Dragon is a sculpture by Jase Moore. It is made completely of scrap metal. On the edge of the Nogoa River you will find the Emerald Botanic Gardens. 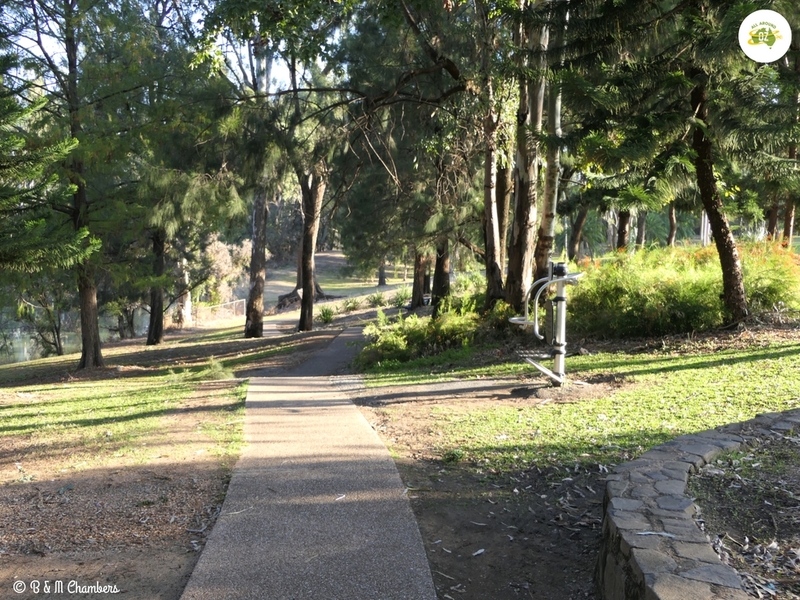 Spread out over 42 hectares the park has six kilometres of walking tracks and exercise equipment as well. There is also a large playground and plenty of secret spots for the kids to explore including a maze. There are also lots of spots for a picnic with plenty of picnic tables and barbeques dotted through out the park. Perhaps the best thing about the Emerald Botanic Gardens is the fact that just outside the main entrance is a free camp where you are able to stay for 20 hours. This is a very popular spot by the looks of things. We spent some time chatting to other travellers including a couple of truckies who were availing themselves of the BBQ’s to cook their dinner. One thing I will mention is that in the centre of the park is a large colony of bats. As we were there late in the afternoon they were very active and very noisy and of course the smell in that area wasn’t great! The Emerald Botanic Gardens were a lovely spot for a late afternoon walk. Just a short 45 kilometre drive west of Emerald you will find the Sapphire Gemfields. Scattered around the tiny villages of Rubyvale, Sapphire and Anakie, sapphires were first discovered in the area in the late 1800’s. Between 1970 and the early 1980’s were the peak of mining operations in the area. These days, a couple of working mines still operate but the area is frequented more by those who love to do a bit of fossicking. This popular pass time means there are loads of accommodation options within the Gemfields including several caravan parks, free camps, motels and cabins. Much of the landscape is littered with relics of days gone by. The tiny village of Rubyvale boasts a great looking pub and a lovely coffee shop. If you want to learn more about mining check out the Miners Heritage Walk in Mine at Rubyvale. Tours are available 7 days a week or you can fossick for your own gems. Another spot where you can fossick in comfort is Pat’s Gems at Sapphire. There is also a coffee shop and a gift shop there. The final village is that of Anakie. Again just a tiny speck on the map but offering a pub, accommodation and a history lesson as well. If you want to try your hand at fossicking there are designated fossicking areas around the Gemfields but you will require a permit. 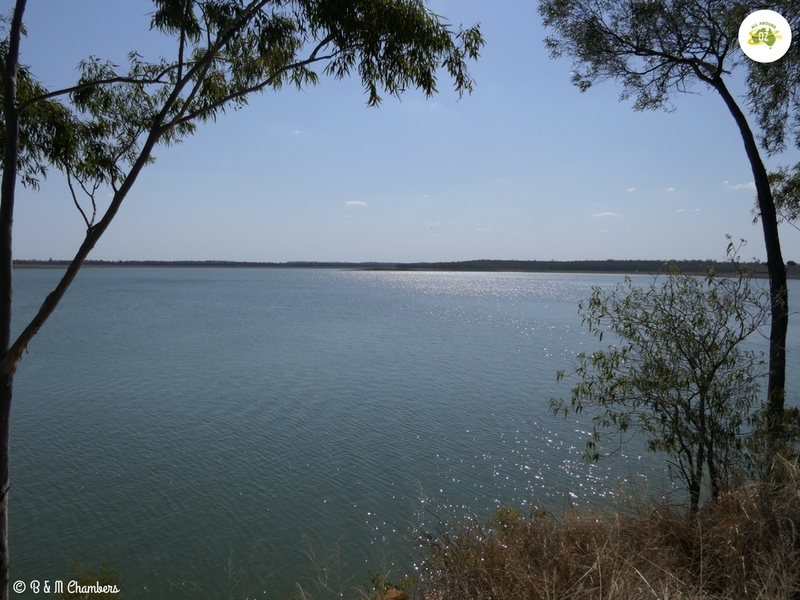 Lake Maraboon is located just 25 kilometres south-west of Emerald. It is an extremely popular spot for fishing and water sports. At first I thought there were two bodies of water there but as it turns out Fairbairn Dam is the structural part and Lake Maraboon is the water part. 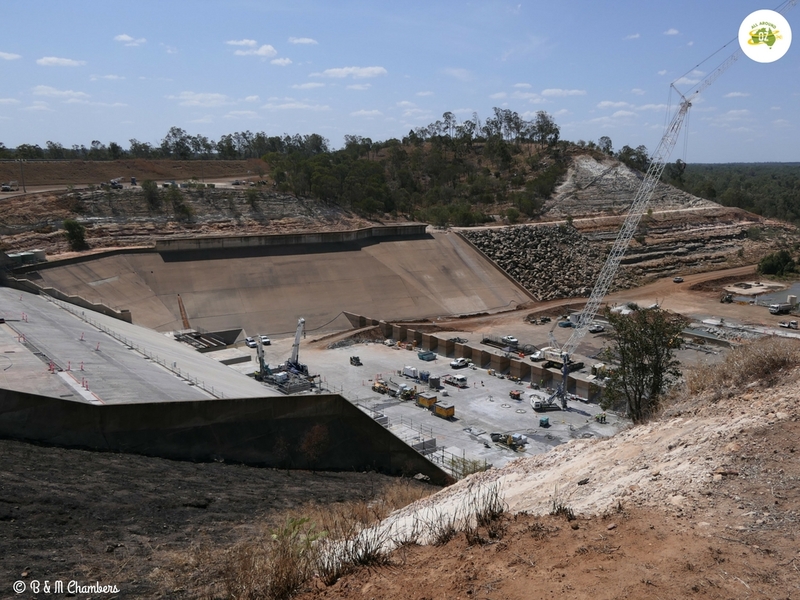 Currently Fairbairn Dam is undergoing works to ensure the dam can cope with extra rainfall. It looks like it is a huge project and hopefully they won’t get in heavy rainfall before the project is finished. Work is being carried out below the dam wall at Fairbairn Dam. Lake Maraboon is a huge body of water and is obviously very popular in summer. We found a great picnic area overlooking the dam where we enjoyed our lunch. 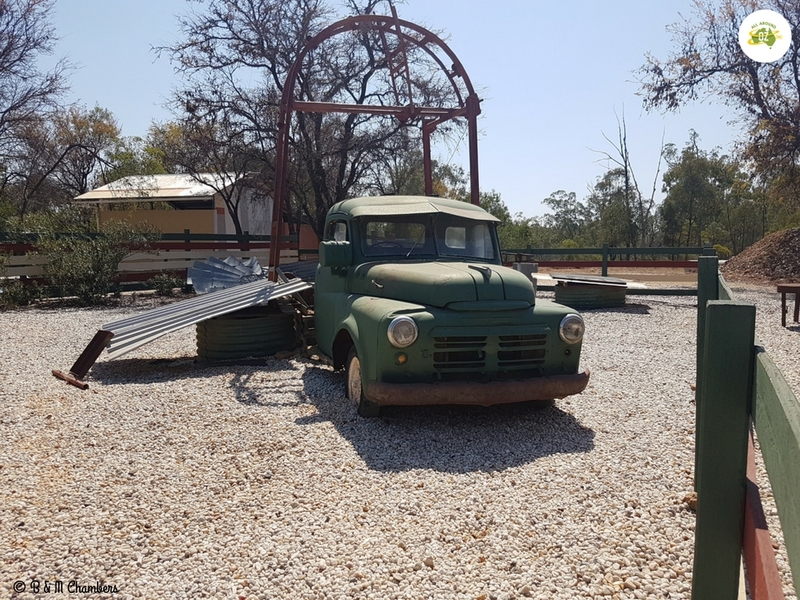 The only accommodation at the dam is Lake Maraboon Holiday Village which looked to have a variety of options including cabins and caravan sites. Might be a good spot to stay next time. It even has a cafe and bar. Lake Maraboon near Emerald is a popular spot for water sports and fishing. We really loved our time in Emerald and we are looking forward to visiting again one day. We think you will find plenty of things to do in Emerald to keep you busy for at least a few days. Whilst in Emerald we stayed at the Emerald Cabin and Caravan Village. We stopped at Emerald during our travels around Australia. I agree that it is a great little place to spend a few days as there is a variety of things to do and see. We had a lovely picnic on the shores of Lake Maraboon. There were hundreds of pretty green parrots in the trees. There are also extensive citrus fruit orchards and paddocks of sunflowers in the surrounding area. We would have loved to stay at Lake Maraboon but school hols made it a bit busy for us. Saw lots of orchards on our way out to the Lake. Very pretty spot!